It doesn’t take much to convince me to sign up for a run event. 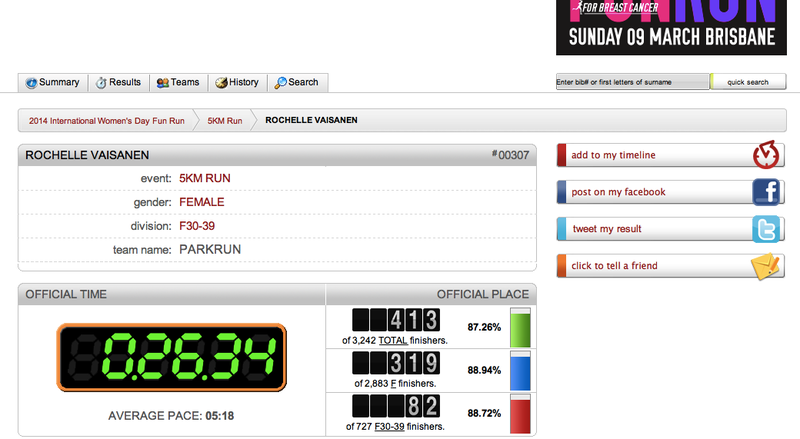 Well, a short run event (I have signed up for a Half Marathon in July… I may need to reassess that one…). When I saw a parkrun group had been set up for the International Women’s Day run, I jumped straight on it. I’ve come to terms with the fact that I may have to attend these events solo; I think I’ve exhausted the “join me for a run” request with my friends. These events cater for everyone. You can run or walk. With a crowd of 8000 your chances of achieving a personal best time are limited, unless you can get out in front of the crowds. It’s called a “fun run” for a reason. Mater Chicks in Pink were one of the major sponsors for this particular run. The Mater has been my home for many occasions through treatment; I was happy to part with $35. The money will go a long way to help women and their families through treatment and Brisbane runners raised $170,000 – the most ever for this event!! Brilliant. It was a cooler morning; clouds gathered and showers threatened to keep the crowd of eight thousand (plus) on their toes… The lovely lady who set up the parkrun group collected my race kit prior to Saturday and we arranged to meet by the wheel at South Bank. After connecting on Facebook we learnt about each other’s treatment. Pip had started radiation on Tuesday, just five days prior to the run. It wasn’t just a 5 km run; it was a run to show mental and physical strength. Showing cancer whose boss! I felt out of place as I waited. I was dressed all in black, in a sea of pink. After sending the, I’m in front of the wheel text, Pip and her daughter arrived and handed me my race kit. In the most elegant way possible I changed out of my black singlet and slid on my pink race shirt. I now looked the part. In a crowd of 8000, I was surprised at how many people I recognised, or recognised me. From old friends I haven’t seen for years, to regulars from Ipswich parkrun. As I waited in the crowd at the start line I looked to my left and found myself next to Wayne, who had volunteered the day prior at parkrun! We talked shop, running shop and I realised this was my first 5 km run since January. I had no major expectations – have fun and get over the line without stopping. The starting gun sounded and I shuffled along in the crowd, practically walking over the start line. As I was running solo I set my Nike Run app to start and popped in my headphones. The course was fairly flat and scenic. The legs felt good and I saw a 1 km sign ahead. Is that all… sigh. A pace report came through the headphones as I passed the first kilometre. It was fairly decent pace! How can that be, in a crowd this big! OK Rochelle… let’s keep going at this pace. As I ran, I thought of the person in front. I wondered what their story was. Had they been through treatment? Were they running for a friend of family member? With my mind occupied I put one foot in front of the other, kept my eyes locked on the pink shirts and before I knew it, there was only 1 km to the finish. I switched on my old race mentality and targeted a few runners to catch. Having run at a steady pace, I knew it was possible to beat my previous time of 28:00. The last stretch was lined with spectators, the cheers and claps gave me the last push and I sprinted over the finish line. A glance of my iPhone revealed a time of 26.43. Stoked! My next challenge is to get back to my pre-treatment time of 24.00. For now… I’m happy.